Around the end of August, eagle-eyed users noticed that the Verizon logo is absent from the list of Samsung Pay partners. This did not bode well for any Galaxy S6-line or Note5 owner who got it from the large carrier, as it seemed that the mobile payment program may not be active on their devices. Shortly afterwards, however Verizon contacted us and confirmed that it is in the process of evaluating the service, deciding whether it will be getting on board with it. 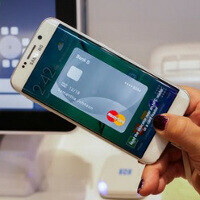 Well, a bit more than a month later, the company has said that it is ready to launch Samsung Pay services on Verizon-issued devices. Users should look out for an update in the (near?) future, which will enable the app on their Galaxy S6, Galaxy S6 edge, Galaxy S6 edge+, or Galaxy Note5. Those of you who have access to it – how are you enjoying Samsung Pay? Don't get to excited, an update on Verizon will take at least a month. Sammy had a really good thing going here if they could get most of the big banks to sign up. Shame it didn't go as planned. I'm hoping it will be before October 11th since that's the last day you can sign up to receive a wireless charging pad or wallet flip cover for free (only available to Note 5 or S6 edge+ owners) just by registering to Samsung Pay. Fingers crossed! Verizon should absolutely, positively NOT be able to block something like this. The fact that they did shows what a scumbag corporation they are. Well to late now. I moved my 4 lines at the end of august because they were still up in the air about it. when I called they said the only info she could give is it was being decided by Verzion and details would be released later. That wasn't a good enough answer for me. It costs me $675 to move 4 lines to T-Mobile who gave me $1150 for my Note 4 and S6 Edge 128GB total and they are paying off all my lines too, so I will be getting my $675 back soon. With the money Verzion charges, I get sick of this BS bloacking phone features because they think they own MY phone that I have to pay for. I am sick of locked bootloaders, stripped out features and Verizon bloatware, though TMobile has the same bloatware, but at least I get my phone unlocked from day one, I can root if I wanted too too. I have a tablet and Gear S on VZW, just to keep at least one line open if I decide I want to come back with one of my lines. But VZW has left a bad taste in my mouth after dealing with their BS since 1996 when I started with them when they took over GTE in South Florida. I wouldn't be surprised if others left for the same reason, as I am sure I am not the only one. Customers had a petition out to VZW to tell them they want Samsung Pay or they were leaving. The threads on VZW site with users asking about Samsung pay was well over 5000 unique posts. Verizon simply couldn't ignore that or potentially lose thousands of customers. They lost me which I was equal to 6 customers total as I had 6 lines with them and now 4 of us have left. Umm all verizon lte phones are factory unlocked. 2 years ago I was sick of the same kind of stuff from AT&T so I walked. Been with T-Mobile ever since and have never looked back. Just curious. Why did Verizon block Samsung Pay to begin with? Do carriers miss out on potential revenue by allowing their customers to use Samsung Pay, Android Pay or even Apple Pay? Verizon never blocked Samsung Pay, this is not true. They are just slow to test and roll out things. They are a control freak type of company. And in the meantime, they blocked it. This has nothing to do with Apple or Samsung. It's a carrier issue. Just like how with the early iPhones, Verizon couldn't let you access data while on a phone call. regarding technology Sammy has advantage, regarding relationships Apple has advantage, but both will soon catch each other.. This post was subjected to Samsung Pay and Apple Pay only..
Have used both Samsung pay and apple pay and so far samsung as been way better because of mst. Loved watching the checkout guy freak out at CVS when I was able to use samsung pay because he thought they blocked all mobile payments (all the did was disable nfc). Really glad I have T-Mobile also as I think it stinks when other carriors block features on phones on the s5 verizon blocked the download booster, on the s6 they block samsung pay.